August 27 (Bloomberg) -- Oyu Tolgoi LLC has submitted an update to its underground mine Feasibility Study, satisfying a key requirement before project financing can be approved, according to Bodibilguun Galsan, spokesman for Mongolia's Ministry of Mining. * NOTE: A $4 billion project financing package to fund the underground expansion of Oyu Tolgoi is expected to be finalized by the end of the year. August 27 (Bloomberg) -- The expansion of Mongolia's Oyu Tolgoi copper mine, one of the world's largest deposits, is scheduled to restart mid-2016 after a three-year delay, operator Turquoise Hill Resources Ltd. said Thursday in a statement. Oyu Tolgoi has filed its revised feasibility study with the Mongolian government and final agreement to proceed with the project is expected early next year, according to the statement. The mine is 66 percent-owned by Turquoise Hill, a unit of Rio Tinto Group, with the rest held by the Mongolian government. Oyu Tolgoi is central to Mongolia's fragile, mining-based economy and its construction underpinned a surge in the country's economic growth to 17.3 percent in 2011. A dispute among its shareholders in 2013 stalled development of the mine's second, underground phase, helping to trigger a collapse in foreign investment. In the first half of 2015, the mine sold $483.6 million worth of copper concentrate, accounting for 20.4 percent of Mongolia's total exports. Final sign-off on the project still requires an updated estimate of capital costs. Funding is in place to cover "pre-start activities" ahead of the official approval, according to the statement. Turquoise Hill shares rose 4.9 percent to $3.00 in New York following the announcement. August 27 (MarketBeat.com) Shares of Turquoise Hill Resources (NYSE:TRQ) have been given a consensus recommendation of "Hold" by the seven analysts that are covering the company, MarketBeat.com reports. Two research analysts have rated the stock with a sell rating, two have issued a hold rating and two have issued a buy rating on the company. The average 12-month target price among brokers that have issued ratings on the stock in the last year is $7.30. Several equities analysts have issued reports on the company. TD Securities restated a "hold" rating and issued a $5.50 price target (up previously from $5.00) on shares of Turquoise Hill Resources in a report on Saturday, May 23rd. BMO Capital Markets reiterated an "outperform" rating and set a $6.50 target price on shares of Turquoise Hill Resources in a report on Thursday, July 2nd. Bank of America raised Turquoise Hill Resources from an "underperform" rating to a "neutral" rating in a research note on Thursday, May 21st. Zacks raised Turquoise Hill Resources from a "sell" rating to a "hold" rating in a research report on Wednesday, May 13th. Finally, TheStreet downgraded Turquoise Hill Resources from a "hold" rating to an "e+" rating in a report on Friday, August 7th. Turquoise Hill Resources (NYSE:TRQ) traded up 5.94% during trading on Thursday, hitting $3.03. The stock had a trading volume of 3,063,852 shares. Turquoise Hill Resources has a 12-month low of $2.65 and a 12-month high of $4.74. The firm has a market cap of $6.10 billion and a P/E ratio of 36.51. The stock's 50 day moving average price is $3.33 and its 200 day moving average price is $3.63. Turquoise Hill Resources (NYSE:TRQ) last released its earnings results on Wednesday, August 5th. The company reported $0.02 earnings per share (EPS) for the quarter, missing the Thomson Reuters consensus estimate of $0.04 by $0.02. The business earned $421.30 million during the quarter, compared to the consensus estimate of $412.72 million. The business's revenue was down 8.3% on a year-over-year basis. On average, analysts anticipate that Turquoise Hill Resources will post $0.14 EPS for the current fiscal year. August 28 -- For the six months ended 30 June 2015, Mongolian Mining Corporation ("MMC" or the "Company") and its subsidiaries (the "Group") mined a total of 2.2 million tonnes ("Mt") of run-of-mine ("ROM") coal and sold a total of 1.0 Mt of coal products, generating a total revenue of United States Dollar ("USD") 71.8 million, compared to 6.5 Mt of ROM coal mined and 3.2 Mt coal products sold with total revenue of USD192.6 million for the six months ended 30 June 2014. The decrease in total revenue was attributable to the continuing further downward pressure on coking coal price which was caused by oversupply which led to a lower sales volume of washed hard coking coal ("HCC"). The average selling price ("ASP") of HCC was USD64.1 per tonne for the six months ended 30 June 2015 compared to USD86.2 for the six months ended 30 June 2014, representing a decrease of 25.6%. The ASP of sales under Free-on-Transport ("FOT") and Cost-and-Freight ("C&F") terms were USD77.0 per tonne and USD110.4 per tonne, respectively during the first half of 2015, compared to USD99.1 and USD124.1 in the first half of 2014, respectively. The ASP of sales under Delivery-at-Place ("DAP") Ganqimaodu ("GM") terms was USD54.2 per tonne in the first half of 2015, compared to USD72.7 per tonne in the first half of 2014, representing a decrease of 25.4%. The Group sold approximately 0.6 Mt of HCC, representing 56.1% of total sales volume, under DAP GM terms generating USD30.9 million revenue and 0.4 Mt of coal products with revenue of USD40.9 million under FOT and C&F terms for the six months ended 30 June 2015. For the six months ended 30 June 2014, sales volume under DAP GM terms was approximately 2.5 Mt, representing 79.2% of total sales volume, with revenue of USD119.1 million, and 0.7 Mt of HCC was sold under FOT and C&F terms with revenue of USD73.6 million. The loss attributable to the equity shareholders of the Company for the six months ended 30 June 2015 was USD79.1 million, compared to a loss of USD28.0 million for the six months ended 30 June 2014. The basic loss per share attributable to the equity shareholders of the Company amounted to USD0.85 cents for the six months ended 30 June 2015, as compared to basic loss per share of USD0.61 cents for the six months ended 30 June 2014. Major contributing factor of the Group's net loss position is the further downward pressure on ASP of coking coal products amid competitive market conditions driven by the continued imbalance of global coking coal supply and demand and lower sales volume of HCC. The Board does not recommend the payment of dividend for the six months ended 30 June 2015 (dividend for the six months ended 30 June 2014: nil). Within the Group's principal target market, China, crude steel production decreased by approximately 1.3% during the first half of 2015, compared to the same period in 2014. With steel mills and coke producers reducing their production and rebalancing inventory levels accordingly, the consumption of coking coal decreased by 14.1% compared to the corresponding period of the previous year. Within this decrease, domestic coking coal production declined by 13.5%, and coking coal imports declined by 30.1%. The price of coking coal remained under pressure amid competitive market conditions, driven by the continued imbalance of global coking coal supply and demand. Recently, it was reported that the quarterly benchmark price for low-volatile HCC for the third quarter of 2015 was settled by Australian producers and Japanese customers at USD93 per tonne under Free-on-Board ("FOB") Australia terms, compared to USD110 per tonne in the second quarter of 2015. According to China Coal Resource ("CCR"), the coking coal price in China's main steel producing area of Tangshan declined from Renminbi ("RMB") 900 per tonne in December 2014 to RMB770 per tonne in August 2015. During the period under review, the Group's management continued to focus on strict liquidity management through tight control over operating and capital expenditures, and limiting credit risks. As such, the Group's production output in the first half of 2015 was optimized to support this strategy, and capacity utilized was adjusted downwards based on sales volume projections to ensure continuity of supply to customers under cash prepaid terms. HONG KONG, CHINA--(Marketwired - Aug. 30, 2015) - SouthGobi Resources Ltd. (TSX:SGQ) (HKSE:1878) ("SouthGobi" or the "Company") today announces confirmation of the extension to the Toronto Stock Exchange (the "TSX") delisting review until September 30, 2015. As announced by the Company on July 29, 2015, a meeting of the Continued Listing Committee of TSX (the "Committee") was scheduled on August 25, 2015 and their decision was expected no later than August 28, 2015. On August 28, 2015 the Company received confirmation from the Committee that it will schedule a review meeting on September 28, 2015 and will defer its delisting decision as to whether the Company has met the listing requirements of the TSX until September 30, 2015. The Company believes the extension will provide sufficient time for the implementation of the Proposed Funding Plan described in the Management's Discussion and Analysis (the "MD&A") issued on August 13, 2015, which will allow it to meet its short term financing needs, and that it will be compliant with the continued listing requirements of the TSX; however, no assurance can be provided that the Proposed Funding Plan will be successfully implemented or to the outcome of the remedial delisting review when it occurs and the Company's Common Shares may become subject to delisting from the TSX. If, at any time, the TSX becomes aware of additional negative developments such that the continued trading or listing of the Company's securities is contrary to the public interest, an expedited review will be initiated. For additional detail, please refer to the section "Liquidity and Capital Resources" under the heading "TSX Financial Hardship Exemption Application and Status of Listing on the TSX" in the MD&A issued on August 13, 2015 and available on SEDAR at www.sedar.com. · Successful completion of 100% acquisition of Auminco Mines Ltd, adding two advanced Mongolian coal projects to the Company's portfolio. · Four Memoranda of Understandings (MOU's) now signed with Mongolian government entities for potential coal supply from the Berkh Uul coal project. · First drilling program at Berkh Uul confirms the thickness and quality of coal seams as indicated in historic drilling, and extends the deposit 1.5km south of previous drilling. Coal intersected at shallow depths of less than 80 metres in 17 of the 18 holes drilled. · US$10 million Sale Agreement executed for the Akoase gold project in Ghana. · Placement raised $2,177,000 (before costs). In September 2014 the Company completed its acquisition of 100% of Auminco Mines Ltd (Auminco) which holds two high quality strategically located coal projects in Mongolia (Figure 1). There is near-term production potential from the Berkh Uul bituminous coal project, located near the Russian border, rail infrastructure and potential off-take customers. The Khonkhor Zag anthracitic coal project is located on a granted 30 year mining lease close to China's border with only 2 km of the 4 km strike explored by drilling. 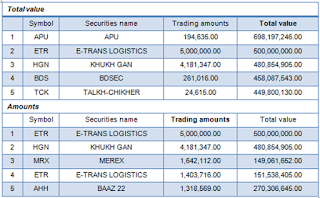 August 28 (MSE) On 28 August 2015, On the "II" classifications, total 2,199 shares of 8 companies were traded. 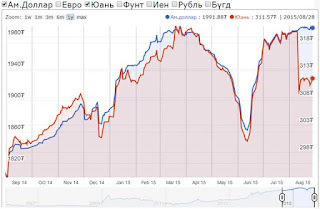 Mongolian Stock Exchange organized 5 securities trading sessions and made transaction of MNT10,023,474,570.00 between 24 August 2015 and 28 August 2015. 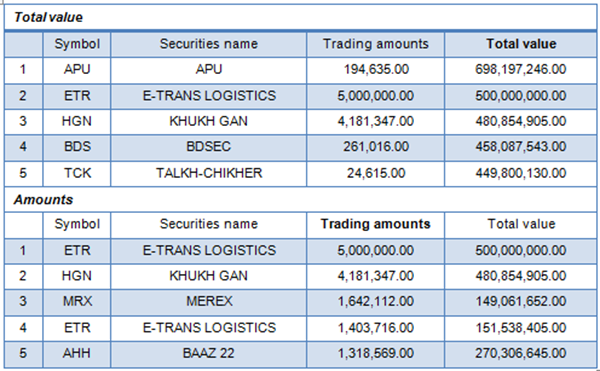 50,477.00 shares of 23 joint stock companies worth of MNT23,474,570.00 were traded. As of August 2015, market capitalization was MNT1,271,645,706,649.00 which indicated decrease of 2.43%, and MSE ALL index reached 951.37 units which indicated decrease of 1.39% from the previous week. August 27 (MSE) Mr. Andrew Chiu, representative from Bloomberg Financial Information in Beijing visited to the Mongolian Stock Exchange and held meeting with Angar.D, CEO of MSE. During the meeting, discussed about disseminating the information of MSE listed joint stock companies and other securities through Bloomberg terminal and those information to be updated quickly. Initially, information of the Top 20 companies, including financial statement is ready to upload to the Bloomberg terminal and furthermore, securities market information will be uploaded regularly. Thus, it will open the opportunity to spread quickly information on the Mongolian stock market in much more open and transparent, and pleasant step to attracting foreign investors. August 27 (MSE) As of August 25, 2015 total of 235 joint stock companies listed at Mongolian Stock Exchange and hereof Mining companies 16.6%, Manufacturing 23%, Agriculture 14.9%, Construction and transformation 28.1%, Sales and Services companies 17.4% composed respectively. As of August 25, 113 companies' shares have been traded at MSE out of eligible for trading 160 companies. In addition, 53 companies trading have been suspended by the Financial Regulatory Commission due to breach of obligation. August 27 (BoM) On the Foreign Exchange Auction held on August 27th, 2015 the BOM has received bid offers of USD 28.0 million in a rate between MNT 1987.00-1993.00 and CNY 82.1 million in a rate between MNT 307.00-310.00 from local commercial banks. The BOM sold USD 23.6 million in a closing rate of MNT 1988.00 and CNY 54.0 million in a closing rate of MNT 308.00 respectively. On August 27th, 2015, The BOM has received MNT Swap agreement bid offer equivalent to USD 66.0 million and USD Swap agreement selling bid offer equivalent to USD 3.0 million from local commercial banks and the BOM has accepted the offers. August 28 (gogo.mn) Bank of Mongolia started the initiative to invite prominent researchers and analysts from around the world specializing in economic development and legal issues in order to enhance the experiences of Mongolian specialists and researchers. This time the prominent researcher Shozo Ota, Professor in the Graduate Schools for Law and Politics at the University of Tokyo and Makoto Yano, Professor of Economocs at University of Kyoto will be deliver lectures on Correlation of Market Quality and Economic Development at the Bank of Mongolia. Shozo Ota is currently a Professor in the Graduate Schools for Law and Politics at the University of Tokyo. He received his B.A. (1980) and M.A. (1982) in Law at the University of Tokyo and was employed there as a Research Associate from 1982-1984. Between 1984 and 1991, he served as an Assistant Professor on the Faculty of Law at Nagoya University and returned to the University of Tokyo in 1991 as an Associate Professor. He became a full professor in 1997. His fields of interest include Law & Society, Law & Economics, Law & Negotiation, Dispute Resolution, Civil Procedure, AI & Law. August 27 (UB Post) Mining Minister R.Jigjid was interviewed about timely issues in the mining sector of Mongolia, such as Oyu Tolgoi and Tavan Tolgoi mines. A Mongolian delegation headed by Prime Minister Ch.Saikhanbileg visited Dubai in May to resolve the matter of Oyu Tolgoi's underground mining development plan. After the signing of the deal resulting from that meeting, it was said that a substantial amount of investment can now flow into the country. Has investment improved in the mining sector since then? Of course, investment will not automatically flow in. The Oyu Tolgoi project will attract a substantial amount of investment to the Mongolian economy. If the project is executed successfully, we will have plenty of investment. By singing the plan, the world's outlook on Mongolia has become positive. But it is too early to say that investment has grown since. To start and operate the underground mine will require a great amount of capital. To raise this capital, the preparation work to acquire loans from foreign markets, particularly banks, is currently taking place. Within the project plan, the project is set to contribute 350 million USD this year to the state budget and 1.2 billion USD next year. Once the project is in motion, investment will improve. It was reported that the investors' side has submitted the pre-feasibility study to the government of Mongolia. Is that true? The investors' side submitted the pre-feasibility study yesterday (on Tuesday). Our specialists have begun their work on this. How much money is left to be repaid to Chinese steel giant CHALCO from the Tavan Tolgoi coal mine? I was told that we are to receive around 30 million USD from CHALCO, and we owe them 140 million USD. So the outstanding debt is at around 110 million USD. How are coal exports compared to projections? There were reports that tax revenue from coal exporters did not reach their target. In the first seven months of 2015, coal extraction exceeded targets with a completion rate of 105.6 percent; 12.5 million tons of coal was planned and 13 million tons were extracted as of July. Coal mining was expected to contribute 77.4 billion MNT in the first seven months of 2015, and so far they have accumulated 72.6 billion MNT. So they are at 93.8 percent. We expect to extract 21.1 million tons of coal this year, and completion is currently at 61.6 percent. Coal mining's contribution to the state budget this year was projected to reach 132 billion MNT, which is currently at 54 percent. August 27 (news.mn) Last month, the Government of Mongolia approved a protocol on "Preliminary Financing of the Purchasing Gold". Under this protocol, the Government has decided to provide MNT 256 billion to gold mining companies. Currently, 46 entities requested financial support. During the first seven months of 2015, the Natural Resource Authority transferred MNT 24.4 billion to the State Budget, of which MNT 19.2 billion comes from the payment for obtaining special permission for geological exploration, MNT 1.1 billion from exploration indemnity with the State Budget money, and MNT 4.1 billion from other sources. Also, the Petroleum Authority of Mongolia (PAM) has transferred MNT 102.7 billion to the State Budget. August 30 (UB Post) Jubilee Debt Campaign, an organization that strives for breaking the chains of debt, published an interesting report last month. They named nine countries (Bhutan, Ethiopia, Ghana, Lao PDR, Mongolia, Mozambique, Senegal, Tanzania, and Uganda) that have become fully dependent on external debt, and emphasized that the gap between the rich and the poor in these countries keeps growing despite their high economic growth. Their citizens are demanding that their governments stop raising more loans from the international capital market and fully disclose the expenditure of previous loans in detail to the public. In economies that are almost fully dependent on a small number of mineral resources and their prices, the government has only two choices: increased debt or increased development. It is time for Mongolians to discuss what these choices are and what Mongolia's choices should be in the future. On August 10 of this year, China weakened their strictly controlled currency by two percent against the U.S. dollar for the first time in 20 years. China's government explained that they took this action to support their exports, which decreased by 8.6 percent within a year. As a result, international stock market indices have started falling amidst the fear that China's unlimited consumption could decrease. If large investment funds start selling their China-tied securities, a lot of companies will see drops in the price of their shares and will have to downsize their business. Economies like Mongolia's, which export their coal, copper, and gold solely to China, will be experiencing another hit. When Mongolia issued bonds worth 1.5 billion USD from the international capital market in 2012, investors believed that Mongolia would be able to satisfy China's never-ending demand for commodities, and were willing to purchase bonds worth 10 billion USD. However, the investors, who bought the bonds with a coupon rate of 4.5 percent on average, sold them with a presumed yield of nine percent. It was written about in The New York Times on August 22. This shows that Mongolia's risk of not being able to make the payments on time has doubled. It is believed that if the calculated yield of a bond being traded on the secondary market is higher than the initial coupon rate, there is a greater risk in regards to repayment. After announcing their intention to obtain a long-term loan to repay debt from the previous short-term loans, Prime Minister Saikhanbileg's government purchased Chinese bonds at the cost of one million CNY, at a rate of 7.5 percent. This is a warning that the risk is growing. 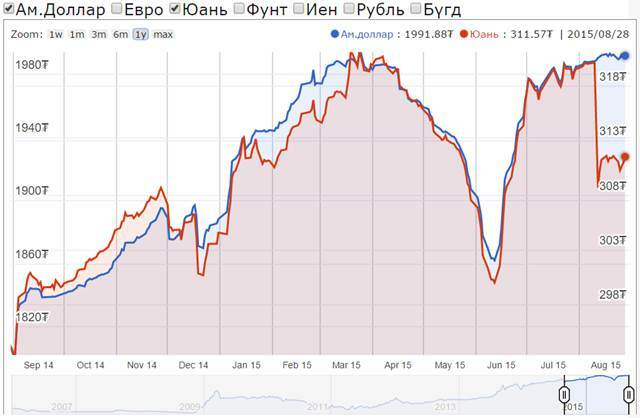 This means that if Mongolia issues sovereign bonds today, the coupon rate will be 10 percent. Governments that issue bonds with such high rates are referred to as dubious borrowers in the international market. The history of Greece's bankruptcy began just like this: repaying debt with more debt, while interest rates increase. Countries such as Norway and Chile have gained a lot of experience with this concept. Even though almost every parliamentarian in Mongolia and dozens of ministers have visited these countries to learn from their experiences, they have not put these teachings down on paper. It is reminiscent of the Mongolian phrase, "A donkey would not know if there is gold or water in his ears." The government today is doing nothing about how and when the loans should be repaid. Instead they are busy trading positions and ministerial seats. Mongolia's authorities are about to pass a law to grant amnesty to their associates who are under investigation for corruption charges. Although the president partially vetoed the proposed law, the bent lawmakers are still expected to oppose the veto and protect those who stole public property and wasted the capital that came from bonds. August 28 (gogo.mn) Media has reported on the possible discussion of the ministerial candidates in coming days. Then sources have confirmed the dates of the Special Session. Speaker of the State Great Khural delivered the letter to the Prime Minister on submission of the ministerial candidacy no later than September 6th on August 25th. In that regard, the Special Session is scheduled on September 7th. The primary issue on the agenda for discussion will be the appointment of the six ministers and then the Presidential veto on Law on Pardoning. Source: The article is by D.Gerel and was originally published on Zuunii Medee. August 28 (news.mn) -The public is saying that the Democratic Party is postponing the work of Government, by not selecting the new ministers. Can the Democratic Party solve this matter? - The Executive Council of the Democratic Party discussed this issue during the meeting last Friday. We are therefore confident that we can form the Government in space of 30 days, In accordance with the law. - Does it mean that the Prime Minister will present the Ministers to the Parliament? -I hope that, the Prime Minister will present the Ministers on 7th September. We can be able to solve the issue of the ministers before that. -Has your party already choosen the Deputy Ministers? -According to the party rule, the Party Chairman must present the Deputy Ministers to the executive council. Therefore, Chairman Z.Enkhbold presented five persons as a result of which the Executive Council accepted three of them: N.Munkhdash, N.Tserenchimeg, and Ch.Battsogt. Ulaanbaatar, August 28 (MONTSAME) The Prime Minister Ch.Saikhanbileg Thursday held the "Hour for solution" weekly meeting, convening authorities of the "Chingis Khaan" international airport to examine the implementation of some works for improving the airport's daily services. Earlier, the Premier Ch.Saikhanbileg and the Mayor of Ulaanbaatar E.Bat-Uul checked a course of works at the airport such as establishing a transit hall and expanding the hall of guests. In accordance with the Premier's order, the international airport has stopped a routine of welcoming passengers at the arrivals area with several state servants. Abolishing it, passengers are now welcomed with an airport operator and a custom officer, the airport's authorities said. Four working groups have been set up within a commission in responsible for ensuring preparation of the 2016 ASEM Summit. For the time being, construction works of extra parking areas have been completed at 42 per cent. Moreover, it is planned to construct parking areas for five small-sized airplanes, therefore the airport will have parking areas for some 40 planes, said M.Davaajav, head of the "Chingis Khaan" international airport. Due to lack of facilities for checking hand baggage, it is being checked in a chamber of big-sized luggage, said N.Udaanjargal, chair of the customs office at the airport. During the meeting, the Premier clarified a complaint from passengers, and then ordered the airport's authorities to impose tough responsibilities upon officials involved in the violation. August 30 (UB Post) A man from a company called Hunnu Lord was caught handing fake government flyers out to foreigners at the airport, demanding that they buy a magazine for 160 USD to enter the country. The scam was discovered during Prime Minister Ch.Saikhanbileg's unannounced inspection at Chinggis Khaan Airport earlier this month. A video of Ch.Saikhanbileg questioning airport officials has been posted online and gaining attention since last Thursday. In red capital letters, the flyer said, "You, a foreign citizen, must buy Access journal by all means," implying that foreigners would not be allowed in the country if they did not purchase the magazine. Visibly upset in the video, the Prime Minister demanded to know why a typo-riddled flyer with an unauthorized government seal was allowed to be handed out past the airport gate, where only airport staff and passengers are allowed. "[This flyer] has the government seal on it. This means it's to do with me… A man in a white shirt was handing this flyer out to everyone entering the country, past the airport terminal. Who gave them the right to sell their magazine in a restricted section of the airport? Don't you do anything when these strangers use the name of the state? Has Special Security become a black marketplace, like Narantuul?" Ch.Saikhanbileg scolded. The airport officials confirmed that the company had been operating past the airport terminal since June, through a request from the Ministry of Roads and Transportation to provide introductory material for tourists coming into the country. Ch.Saikhanbileg told the airport officials to stop the distribution of flyers, fire two directors in charge of land at the ministry (Mogi: departments, not lands I'm sure), and take appropriate measures among the border protection forces and airport officials. Since Friday, social media users have been outraged by the news. "They've been operating since June and nobody knew until now, at the end of tourism season. Hello! We found the reason why tourism's been down," said an outraged social media user. "This is a sabotage of the national tourism industry, and it's so embarrassing." One social media user asked if Hunnu Lord was going to be prosecuted for fraud, "Are they going to prosecute these people? This is pretty clearly fraud. Oh, what's the point though? They will just get out of jail when the amnesty law passes." Chinggis Khaan Airport and the Ministry of Roads and Transportation have not given official statements on the issue. August 28 (Mongolia Focus) I'm about to head to Ulaanbaatar for a very brief visit. While summer is a time of parliamentary recess and Naadam, it has been a bit more eventful than usual with the de facto dissolution of PM Saikhanbileg's super coalition. About 10 months away from the next parliamentary election, I wonder what's to come and what political mood I will find in Ulaanbaatar. The end of the DP-MPP-Justice-CWGP super coalition was not entirely surprising, even if the timing this summer already did surprise me. 1. The single most important purpose of the coalition was to get resource projects and thus ultimately foreign investment and the economy back on track. This was the first item on my personal Saikhanbileg wishlist, and the announcement reasserting Rio Tinto's and the Government's commitment to Phase II of Oyu Tolgoi construction seems to have granted that wish and fulfilled that purpose. Note the parallel here with the grand coalition of 2009 under PM Bayar and the initial signing of the OT investment agreement. 2. Grand and super coalitions are a political strategic headache going into elections as they muddy opportunities for parties to make a case for their contribution to government and negate the role of an opposition. Note the parallel to the break-up of the grand coalition under PM Batbold in January 2012. But why already in the summer of 2015, rather than late this year or early next year? Since the removal of MPP ministers from cabinet, there has not been an announcement of a re-formed government and new ministers. That would suggest that negotiations with coalition partners are on-going. The two most viable alternative constellations would seem to be either a) a return to a coalition like the one that supported PM Altankhuyag (DP + Justice + CWGP) or b) an MPP-led coalition. Given their crucial seats, this might give Enkhbayar and his Justice Coalition a fair bit of leverage in negotiations with the DP, particularly since the super coalition reduced the MPRP's role somewhat. I tend to dismiss the analyses of Mongolian politics that always point to upcoming elections as a deciding factor. Why am I not so happy with these explanations? To paraphrase German football coaching legend Sepp Herberger ("Nach dem Spiel ist vor dem Spiel"), after an election is before an election, meaning that there is always another election coming, so that the fact that there is an election coming explains very little. Sure, MPs might be thinking more about the coming election 10 months out (i.e. now) than 40 months out, but many politicians (in Mongolia as in other democracies) seem to think in terms of coming elections all the time. However, electoral calculations in Mongolia may have shifted in the past six months. When Ch Saikhanbileg took over as PM from N Altankhuyag, this seemed like a suicide mission. The DP seemed to be committing very public suicide through factional fighting after they'd made a mess of the economy through decisions on foreign investment and also failed with a number of other reforms projects (judicial reform, anti-corruption). Saikhanbileg was taking a bullet for the party knowing that chances in the 2016 election looked dire and perhaps hoping that this would give him political credibility in a future election as the DP leader that righted the ship and set it on a new course knowing that electoral defeat was coming. Now, that electoral defeat doesn't look as certain any more, though still likely. What's changed? Well, that Oyu Tolgoi announcement primarily. The measurable economic impact until the June 2016 parliamentary election will be negligible, but it has changed perception. The tugrik might well continue to slide, the government still has no money and will struggle to begin repaying bonds (though cleverly playing Indian and Chinese desires for influence off against each other will likely allow them to stall on payments), many people will struggle with inflation in daily lives given lack of employment, but at least there seems to be a light at the end of the tunnel. This will obviously be the case that Saikhanbileg (or any DP prime minister or Z Enkhbold as party chairman) will make in next year's campaign. For the MPP this continues to be a situation of damned if you do, damned if you don't. If the MPP stays out of government, this makes it easier for the DP to argue that they've corrected their past errors and are on the right track, claiming the shift in sentiment due to the OT announcement as their achievement. If they stay in some kind of government, it makes it more difficult to emphasize their own contributions. This quandary presents itself at a time where there also seems to be some turmoil within the MPP. While the party always represents itself as unified at election time, the split of the reformed MPRP under N Enkhbayar is only the most obvious indication that the MPP is not free from factions either. Much has been made of the apparent popularity of independent MP S Ganbaatar, but more in terms of a potential presidential bid and someone that might shift debates ahead of the parliamentary election toward populist demands. To have a chance in any presidential contest, Ganbaatar would have to be nominated by a party sitting in the Ikh Khural, of course. This need has led to speculation about any new parties, perhaps especially the HUN Party that seems to be in formation. We provided a quick sense of this National Labour Party in a post in early June, but I'm eager to learn more about their agenda and potential role in politics on this upcoming visit (not to support their effort, of course, as my interest as a foreigner is in analysis not in influencing politics). There have been some discussions of a new party law and of changes to the electoral system in recent months. It appears that the latter have become muted somewhat. Proposals had included a shift to 76 newly-created electoral ridings with first-past-the-post voting or a number of other alternatives. For now, it seems that the most likely outcome would be continuity from the 2012 election (for once), i.e. a mixed system of proportional representation and first-past-the-post electoral ridings with the twist of multiple candidates in some ridings. The women's quota for political candidates also seems to be likely to remain. August 27 (news.mn) B.Gankhuyag, who runs the Mongolian People's Party (MPP) Reform Commission, has said that the MPP has begun taking MNT 100 million from those members, who want to stand as candidates in the 2016 Parliamentary Election and the MPP is making contracts with these members to let them contest in the electoral districts. It should be noted that Gankhuyag's statement is not the official position of the MPP. When the MPP was in co-operation with the Democratic Party, the so-called "Solution Government" planned to make additional changes to the "Electoral Law". The MPP, however, left the Government before the changes the "Electoral Law" could be made. Therefore, there is a high possibility, which the Parliamentary election will be organized under the parallel system, which combined district votes with nationwide proportional voting as was the case in the 2012 election. August 30 (UB Post) The following is an interview with D.Khayankhyarvaa, Member of Parliament and deputy head of Mongolian People's Party (MPP), about timely issues. Lately, the Amnesty Law has been at the center of public attention. Most MPs believe it is right to pass the law, but seem to have conflicts in opinion on the partial veto by the President. What's your view on the Amnesty Law? The position of the MPP was clear from the beginning. We've been saying that higher officials shouldn't be pardoned. I did express my own position when Parliament was discussing the Law on Economic Transparency because I don't think that there are businessmen among people who concealed their assets. Businessmen don't need to conceal their assets. It's beneficial if they disclose their assets and financial status and make one MNT into 10 MNT. I believe the Law on Economic Transparency is aimed at people who've obtained both hidden assets while serving a specific role for a specific period. The Amnesty Law was amended so that corruption and bribery cases of recent years would be overlooked. Is it even possible to submit such law? More than 400 cases related to bribery, which are being inspected by the Independent Agency Against Corruption (IAAC), as well as major cases in courted, are about to be pardoned by the Amnesty Law. The main purpose of the law shouldn't be this, but dedicated to people whose freedom s were removed because of minor reasons. The Mongolian state must give amnesty to these people and take preventions so that they don't make another mistake. How do you perceive the President's veto on the Amnesty Law? After the law was passed, the President of Mongolia expressed his opinion and announced his decision to lay a partial veto. That veto has been submitted to Parliament as well. Personally, I completely support the President's decision. Our faction already held a press conference to convey that we support the President's partial veto. Critics say that accepting the veto will lessen the number of people who can receive a state pardon and that even first-time offenders in prison will not be pardoned. Can you comment on this? There's no such thing. I've read the articles the President laid veto on. As the Head of State, he exercised a veto on articles related to bribery and corruption. I'm aware that all other articles are being included in the Amnesty Law. Corruption, bribery and theft are referred by the same term in articles and provisions. Does it mean that they can't be included in other pardons separately? The law itself was composed very cleverly, content-wise. As long as the Mongolian state exists, these things should be distinguished and amended properly. Will revision or amendment be required for the Amnesty Law if Parliament approves the veto? If it's required, amendments or revisions can be made. People are saying that the Justice Coalition racketeered and changed the first draft bill submitted by the government so that the law would be beneficial to former President N.Enkhbayar. Did the Mongolian People's Revolutionary Party (MPRP)'s Justice Coalition influence the draft of the law? I can't say that the Amnesty Law was dedicated to one person. However, I acknowledge that it's dedicated to a group of people. If we evaluate how issues related to Chairman of the MPRP N.Enkhabayar were raised in the Amnesty Law, it is because there's a part in the law saying that crimes would result in acquittals, rather than a pardon. If we consider from this perspective, we can't deny that there was some sort of influence from the MPRP. Aren't some people from your party also included in the "group of people" and going to be pardoned? The Amnesty Law should be separated from parties and factions. It will not be law if members disapprove or approve the law because it doesn't apply to MPRP members or pardons DP members. The law should apply to everybody equally. The public hopes for the law to be adopted. Some people say that there will be various difficulties starting from economic difficulties if people aren't pardoned during warm seasons. Others state that convicts in prisons may even strike if the veto and other issues are discussed unjustly. Do you agree with these claims? Obviously, a law should be enforced from its specified implementation date if it has been passed. I don't think the country will be economically efficient by adopting the law during warm seasons. Costs of prisons will be provided even if the adoption is prolonged. In other words, I don't see much difference. It's not certain that everyone released from prisons because of the Amnesty Law will immediately get employed. Mongolia has one shortcoming. Our nation has amended the Amnesty Law five times before. Yet, not once have we taken social reintegration actions for people who've been released from prison. Official agencies take responsibility over the employment of released convicts and tried assisting their lives during socialism. Now, there's no such thing. A state action is demanded for correctly reintegrating people who've been sentenced to prison whether they've been pardoned or not. People are criticizing that despite not laying a veto on previous versions of the Amnesty Law, a veto was laid this time and that it's connected to N.Enkhbayar. The President was also criticized for expressing himself at a meeting of the Prosecutor's Office. Can you clarify on this? The circumstance is very strange right now. Particularly in the past two to three years, politics has been going towards the wrong path like an epidemic. Political conflict has maximized from all sides, including businessmen and the public. This is definitely related to powerful politicians, especially the DP that's ruling the government. People's minds are being corrupted because the thing called political hysteria exceeded its limits and the state is unable to operate as a state. Political parties aren't fulfilling their duties either. This hysteria is an expression of disorder that forces every decision to be explained from the political side and spreads wrong information to the society. People shouldn't be telling the President where he can or cannot speak. As the Head of State, he's well aware of where and what he can and cannot say. Will the MPP's faction in Parliament accept the President's veto if it proceeds to parliamentary discussion level? Our faction has agreed to accept the veto. We've even officially announced our position through a press conference. Our faction has been facing differences in views on the Amnesty Law and Law on Economic Transparency since the beginning. But we've always said that we can't allow this type of law, dedicated to higher officials, to be adopted. Convicts in prison, as well as their families, have long anticipated the adoption of the Amnesty Law. When will these people finally hear good news? That issue depends on the ruling party. They've said that an irregular session will be held and the law would be approved. Yet the Government Press Office suddenly announced that the irregular session was canceled. I was told that the issue would be discussed during the regular session in October, but I recently received a message saying that an irregular session might be organized because the Amnesty Law needs to be discussed before September 6. Right now, the ruling party has made a mess of state works. Simply put, the DP has turned its Prime Minister into a headless horseman. Before the spring session, the Prime Minister (PM) made a major statement saying that he would start Oyu Tolgoi and Tavan Tolgoi. On the following day, he backed out when the Speaker of Parliament threatened to dismiss him if he does that. The PM said he wouldn't submit a proposal to dismiss six MPP ministers because if he did he would give up his position and leave with them. In the end, he submitted the names of those ministers and didn't resign himself. Just recently, when the Amnesty Law was decided to be discussed at the next regular session, the PM changed the date to within September 6. This Mongolian PM has become a jester. Does that person even have a legal advisor or an advisor that teaches him how political works should be handled? It's difficult to have a person acting like a jester or a person without a mind of his own serve an important government position. It will not work if he's constantly under the influence of his party chairman. I hope the DP understands this. August 28 (Shearman & Sterling LLP) Shearman & Sterling is advising a consortium comprising GDF Suez, POSCO Energy, Sojitz Corporation and Newcom in relation to all aspects of the development of the CHP5 IPP, a greenfield coal-fired combined heat and power plant in Ulaanbaatar in Mongolia with an electrical capacity of up to 450MWe and heat capacity up to 587MWt. The four banks mandated by the sponsors for the financing are Credit Agricole, HSBC, Sumitomo Mitsui Banking Corporation and Bank of Tokyo Mitsubishi-UFJ. This is the first IPP project in Mongolia being developed under the PPP program and which will be internationally financed on a limited-recourse basis. The project has been designated as a key project to be "fast-tracked" due to the increasingly severe shortage of heat and power in Ulaanbaatar. The Shearman & Sterling Singapore Project Development & Finance team included partner Bill McCormack, counsel Scott Baggett and associate Vincent Seah. August 30 (UB Post) The National Dispatch Center, National Power Transmission Grid, and Baganuur Power Co. have signed a power and electricity trade agreement concerning the Baganuur 700 megawatt power plant, which will cost one billion USD for construction, on August 28. The industrialization clause in the government's 2012 to 2016 development policy states that Mongolia should work towards becoming an energy exporter and fulfill all of its domestic power needs. Based on this clause, the Baganuur high capacity power plant, to be fueled by the Choir-Nyalga coal mine, is being built. The power plant is expected to help stablize Mongolia's cumulative power system, satisfy the needs of rising power consumption in the central region, and cut down on imported power. The plant is located 130 kilometers from Ulaanbaatar, and has a built-in capacity of 700 megawatts. According to a power consumption study by the central energy system, a source to supply future consumption in the Baganuur-Choir region and in Dornogovi, Dundgovi and Khentii provinces is needed. They study's energy production and consumption balances show that the region will face a 242 megawatt deficit starting from 2019, and a 660 megawatt deficit starting from 2022. In August 2014, the Company's operations at the Tavan Tolgoi coal project in Mongolia were suspended following a dispute with the client regarding payment delays for work completed. Failure to reach an agreement led both parties to enter into a standstill agreement in September 2014. In June 2015, Macmahon announced the sale of its Mongolian business to a private company for US$65 million. Full payment was received by Macmahon prior to the year-end resulting in net proceeds of approximately US$62 million. This transaction concludes Macmahon's current mining operations in Mongolia. However, the Company remains optimistic about the future of the mining industry in Mongolia and is currently investigating a number of new opportunities in the region. During the Period, the Group had negotiations with the representatives of the Mongolian Government in relation to the promotion of the drafting of shareholder agreement, and completed and delivered amendments on the confidential agreement and shareholder agreement to the Mongolian Government, whose feedback has not been received up to the date. Moreover, our Mongolian project company continued to complement the supplemental information on the environmental impact report, which is still subject to approval of the Mongolian Government. August 28 (Khan Bank) For the purpose of supporting Mongolian and Hungarian business partners and strengthening their business relations and cooperation, Khan Bank has signed Cooperation Agreement with Representative of Hungarian National Trading House – Magyar Trade House Co., Ltd on the 25th of August, 2015. The agreement has been signed by Mr. Norihiko Kato, CEO on behalf of Khan Bank and Mr. Shandor Rizak, General Director on behalf of Magyar Trade House Co., Ltd, representative of Hungarian National Trading House. This enables Khan Bank customers to import best products and goods of over 2500 Hungarian top companies, industrial equipments and advanced technology as well as to have access to concessionary loan from EXIM bank (Export-Import Bank of Hungary). August 28 (news.mn) The "Erdenes Mongol Company" and the "Beren Group" are cooperating to develop a future coking coal, and metallurgy facility. The companies decided to build a large complex with the capacity to produce 500,000 tons of coal and chemical products, and 300,000 tons of steel. Regarding chemical products there are plans to produce: benzyl, ammonia, phenol, bitumen and sulfuric acid. In addition and building materials like reinforcements will be manufactured. With the surplus of the coking coal gas, the factory will produce liquefied gas or electricity which will be enough to provide domestic electricity demand or to process the gas into liquefied gas. August 27 (gogo.mn) Shiveekhuren ports starts leading by its exports done to China with sales of 830 thousand tonnes of coal worth USD 21.7 million just in past month. Main factor behind the export volume increase at this port was the start of use of the heavy truck route, which was the main bottleneck in the transportation of the coal. According to the statistics data reported by the Chinese side, exports of coal through the Shiveekhuren port increased by 38 percent or was at 4.76 million tonnes in the months from January to July. Coal sales amount also have seen the increase by 43.5 percent at USD 123.6 million. Although Shiveekhuren port comprises more than 50 percent of the total coal exports, the total sales amount is still 46 percent lower compared to Gashuunsukhait port, which mainly exports coal from Tavan Tolgoi deposit. Location of coal mines exporting through Shiveekhuren port is 50 km away from the Chinese borders and is considered as the most suitable for heavy truck transportation, while Tavan Tolgoi deposit located 200km away from the borders requires railway transportation of the coal for the cost efficiency. With the shift of the exports of coal through Gashuunsukhait port to heavy truck has led to the decline in the export volumes. According to the Mongolian Railways the construction of Tavantolgoi-Gashuunsukhait railway is at 87 percent and is currently stalled. Photo: What does Mongolia manufacture? August 28 (gogo.mn) SME manufacturers operating in 21 aimags and capital city are to display their products for three days. For the first ever in Mongolia National Brand Selection days will be organized on August 28-30th during the National Brand Fair. The fair will be held on Chinggis Square and display national brands produced by SMEs operating in the capital city and 21 aimags nationwide. OVer 80 SMEs will be displaying their products and the organizers to award four products as National Brand. Grand Prix award will be presented to the best product and 27 products will be named as National Brands. The exhibition will be displayd at six districts after August 30th until September 10th. August 27 (UB Post) Business delegacies of Japan, headed by Japan Business Federation (Keidanren) Chairman Sadayuki Sakakibara, paid a working visit to Mongolia to attend the Mongolia-Japan Business Forum, on August 25 and 26. They met with President Ts.Elbegdorj, Prime Minister Ch.Saikhanbileg, and Speaker of Parliament Z.Enkhbold. Welcoming the visiting delegates, President Ts.Elbegdorj noted that Keidanren organized the Mongolia-Japan Business Forum in Tokyo, Japan, for the second time in the past few years, and highlighted the importance of their visit to Mongolia to meet business people, state officials, and decision makers with such a wide range of representatives. He stressed that the relationship between Mongolia and Japan has grown stronger, noting that political cooperation and mutual trust are at their highest level. "Now there is a need to bring bilateral economic cooperation into a new stage of development, enriching our relations with new content. His Excellency Prime Minister of Japan Mr. Shinzo Abe proposed the Erch Initiative," he said, and added that Mongolia sees this initiative as the intention to establish more intensive, rapid, and comprehensive relations between the two countries. Chairman Sakakibara of Keidanren congratulated the people of Mongolia on the 25th anniversary of the Democratic Revolution in Mongolia and extended his congratulations to all Mongolians for successfully developing democracy and a market economy. He recalled President Ts.Elbegdorj's visit to Japan in May 2015, where the Mongolian side invited Keidanren to visit Mongolia. The sides discussed opportunities to bring Japan's investment know-how to Mongolia, and touched upon issues of supplying domestic products to the Japanese market and other countries. They also shared views on intensifying Mongolian and Japanese cooperation in mining and infrastructure and introducing Japan's advanced technology to those fields. One of the stated priorities of Mongolia's foreign policy is to advance all appropriate relations and cooperation with Japan, which is considered one of Mongolia's third neighbors, Speaker Z.Enkhbold noted when meeting the Japan Business Federation delegates. Recalling the signing of the economic partnership agreement (EPA) established between Japan and Mongolia, the Speaker said the opportunity to join regional economic integration has been opened for Mongolia, and it has become a big contributor to securing the third neighbor policy in economic terms. He also emphasized that the Parliament of Mongolia intends to make amendments to several laws in order to implement the EPA, and said that these laws will be discussed and resolved in the near future. Sakakibara expressed his gratitude for the warm welcome and said the EPA is under implementation, to be commenced quickly and promptly. He added that Keidanren representatives were looking into opportunities for cooperation in investment and a thermal power plant project. Keidanren is a comprehensive economic organization with a membership comprised of 1,329 representative companies of Japan, 109 nationwide industrial associations, and 47 regional economic organizations. Its mission as a comprehensive economic organization is to draw upon the vitality of corporations, individuals, and local communities to support corporate activities, which contribute to the self-sustaining development of the Japanese economy and improvement in the quality of life for the Japanese people. August 30 (infomongolia.com) Mongolia-Japan Business Forum was held at Ministry of Foreign Affairs of Mongolia on August 27, 2015 in framework of the visit of Japanese business delegation headed by Mr. Sadayuki Sakakibara, the Chairman of Keidanren (Japanese Business Federation). The delegation came to Mongolia on August 26, 2015. The forum has discussed current economic and social conditions of Mongolia and possibilities of economic cooperation between Mongolia and Japan. Minister of Foreign Affairs L.Purevsuren has delivered an opening remarks at the Mongolia-Japan Business Forum. In his remarks, he has stressed the importance of involvement of individuals and private business bodies in implementation of Economic Partnership Agreement (EPA) established between Mongolia and Japan, and further called Mongolian and Japanese businessmen to put into action the motto "Lets survey together, manufacture together and trade together!" of President Ts.Elbegdorj delivered at Mongolia-Japan Business Forum held during his state visit to Japan on May 20-25, 2015. The Director of Economic Cooperation Department at the Ministry of Foreign Affairs of Mongolia, Mr. Yo.Manlaibayar said: "Mongolia considers Japan as its third-neighbor and our political relations could progress greatly. Mr. Sadayuki Sakakibara, the Chairman of Keidanren has already paid a visit to President Ts.Elbegdorj, Prime Minister Ch.Saikhanbileg and the Speaker of Parliament Z.Enkhbold. Based on the results of those meetings I find that there is a huge possibility to deepen our economic relations further, and the goal of this business forum is to introduce profitable economic sectors in Mongolia for investment to Japanese delegation. Leading Japanese companies are financing many major projects like new airport construction project in Khushigt Valley. Furthermore, we plan to introduce economic sectors such as mining, road infrastructure, energy industry and agriculture. As Japan is world leading country in technology it is essential to introduce Japanese mining technology to our mining sectors and inward required investments for the job." KEIDANREN (Japan Business Federation, abbreviation of Keizai Dantai Rengōkai) is a comprehensive economic organization with a membership comprised of 1,329 representative companies of Japan, 109 nationwide industrial associations and 47 regional economic organizations as of June 2, 2015. The mission of Keidanren as a comprehensive economic organization is to draw upon the vitality of corporations, individuals and local communities to support corporate activities which contribute to the self-sustaining development of the Japanese economy and improvement in the quality of life for the Japanese people. For this purpose, Keidanren establishes consensus in the business community on a variety of important domestic and international issues for their steady and prompt resolution. At the same time, we communicate with a wide range of stakeholders including political leaders, administrators, labor unions and citizens. What does soil contamination mean for UB residents? August 27 (UB Post) Air pollution and soil contamination have been common problems for quite some time now, yet nobody has taken any effective action against them. Each year there is a sharp increase in environmental pollution and a growth of the negative effects caused by it. Mongol News interviewed senior worker at the Public Health Institute Sh.Batdelger about this issue. Does the Public Health Institute conduct research on soil contamination each year? If so, which part of the city has research been conducted in lately? Research in 2012 showed that 80 percent of Ulaanbaatar was affected by third degree soil contamination. Some parts had been found to have top soil contamination. In 2013, our scientists took soil samples near schools and kindergartens in Bayanzurkh District and the result was at fourth degree contamination. Recent research done in public areas near Narantuul in the 14th khoroo, Bayanzurkh District found heavy metals in the soil. In the past we did research in the Ulaanbaatar area, but we are now conducting research in each district. Does trash cause the soil contamination around Narantuul, and why has the market area been specifically focused on for conducting research? We cleaned the area surrounding Narantuul on our "Trash Bucket Challenge" day and we took samples from three different areas for soil testing. There are 30 specifications that measure the quality of soil and we test for a few fundamental elements. If the amount of bacteria in the soil is 1 to 1.5 million, the soil is clean. If it reaches around two million, the contamination is low; 2.5 to 3 million is medium contamination, and three to five million or above means there is high soil contamination. The trash found on the surface is directly related to the level of contamination. The unfortunate part is that children are playing in these polluted areas and it's affecting their health adversely. Is it true that some elements that can contaminate the soil are necessary for the human body? Copper is often discovered in soil contamination testing. Copper is necessary for a healthy metabolism and blood circulation. However, high amounts of copper disrupt the normal functions of the liver and kidneys. In particular, copper can cause brain damage in children. Do you take any action to decrease soil contamination, or is only soil testing the main directive of the Public Health Institute? Our institute is planning to work with the World Health Organization to decrease soil contamination in Mongolia. Some countries purify polluted soil within one year, but Mongolia doesn't have the right equipment or money for this, so we have only been doing soil testing at this point in time. Many beneficial bacteria exist in soil and highly developed countries derive clothing materials from these bacteria. Mongolian scientists could also do this, but there isn't enough funding for it. Wooden latrines in the ger district pollute the soil, yet some people drill Abyssinian wells next to wooden latrines. This suggests that the people don't have enough knowledge about soil contamination. What is your opinion on this? People drill Abyssinian wells when they have a wooden latrine in their field. They should understand that groundwater is not pure enough for use. Nowadays the government doesn't pay attention to sanitary issues in the ger district. In the past, if 20 grams of lead had been discovered from testing, we would establish that the soil is contaminated, but we have now increased this amount to 100 grams. The World Health Organization stated that 10 deciliters of lead adversely affects the mental ability of children, but recently this amount has decreased to five deciliters. It is interesting to note that the government always raises the standard amounts in our country. China uses chemicals to plant fruits and vegetables. We believe that our soil is healthy. You said that most areas of Ulaanbaatar are contaminated. Does this mean we will get poisoned no matter where the food we are eating comes from? Soil contamination in China is directly related to their air pollution. These two are inseparable issues, because air pollution pollutes the soil in the winter and contaminated soil pollutes the air in the summer. China doesn't have any choice other than contaminated soil to plant fruits and vegetables. Recently, China spent 2.5 billion USD to destroy 12 tons of harvest crops that were planted in soil contaminated with heavy metals. Our soil contamination is much less compared to China, so we can do some research and plant fruits and vegetables in our soil. The harvest will be less contaminated, however, it is hard to predict the level of soil contamination in the following years. Which part of the city is highly contaminated? It is not necessary to do research to measure the soil contamination and air pollution. We can observe it from how long we can wear clothes without washing them. Our clothes get dirty due to soil contamination; dust is not related at all. The increase in intestinal infectious disease is also related to soil contamination. In other words, we don't need statistical results to measure soil contamination. The pollution is everywhere. Ulaanbaatar, August 27 /MONTSAME/ The National Core Program on Pre-School Eduction will be realized starting from the 2015-2016 academic year. "Children will be able to enjoy free choice of activities, their rights to speech and opinion, self-improvement and the lessons targeted to improve their creativity", said the Minister of Education, Culture and Sciences Mr L.Gantomor at the weekly meeting "Hour of Minister" on August 27. A total of 218,100 children are expected to attend 1,225 kindergartens this year. The number of the children increased by 11,400 compared to the same period of last year. In the academic year of 2015-2016, 539,818 pupils will attend 799 general education schools, of which 64,364 children are first-graders. On the national level, 6,900 kindergarten teachers and 28,800 general education school teachers will be working for enlightenment this year, he said. Average price of a coursebook will be 2,600 MNT. The pupils will be wearing uniforms, tailored by national companies and offered with reasonable prices. Some 169 thousand students will attend 99 state-owned and private colleges and universities. This academic year, the higher-education of Mongolia will fully transfer to a system, where students choose their specialties in their second and third courses. The system of specialty selection, rather than profession selection, is expected to facilitate the students to become more sophisticated specialists in the future, underlined the Minister. In this academic year, education sector will see 153 construction works conducted on the government funding, 26 works- on local funding, as well as 40 schools and same number of kindergartens-- on concession agreements. Moreover, a kindergarten and 21 schools will be built on the aid from the People's Republic of China, and 10 kindergarten building will be built on Japan's aid. General education capacity of Mongolia is estimated to increase by 12,338 pupils, while the capacity of kindergartens will rise by 7,200 children, thanks to the commissioning of 25 schools and 47 kindergarten buildings this academic year. Minister L.Gantomor said that, as of today, eight schools with 4,448 pupils capacity and 10 kindergartens with 1,000 children capacity have been commissioned, as well as 15 new buildings for schools and kindergartens are expected to open this September. August 27 (news.mn) The "Mongolian Private Sector Pre-School Federation" is doing something very practical; it is providing 3000 children of UB high school teachers with free private kindergarten training. The "Mongolian Private Sector Pre-School Federation" made their offer to the Ministry of the Education Culture and Science. Yesterday, senior representatives of the Federation met L.Gantumur, the Minister of Education Culture and Science and concluded a co-operation agreement. The total cost for the 3000 children is estimated at MNT 6 billion annually. In total 27,000 children are not able to go to kindergartens due to the shortage of places in Mongolia. The Ministry has informed that: "Currently it is not possible to start the registration before 1thSeptember. Nevertheless, the 3000 children of the 3000 teachers will start attending the 318 private kindergartens before 1st October". August 28 (Mongolian Economy) Around 3,200 police officers work in Ulaanbaatar city. Norms for the force were adopted in 2011 by government resolution number 131. To comply with this norm, 1,600 officers must be added to the existing personnel. An intense workload makes it hard for citizens to access police services, and on the other hand, risks for police officers are increasing. The reason why the resolution is not actualising has to do with the government. Even if they want to hire additional personnel, they cannot due to a lack of funds. The budget for police organisations is funded from the portfolio of the Ministry of Justice. But one of its advantages is their status of "city," as the city mayor's office becomes a source of funding. The mayor's office assists with creating an environment to work, improving the living standards of the officers and providing protective equipment. This year, they invested MNT 4.5 billion. From that amount, a MNT 1.9 billion tender to construct the building of Bayanzurkh district's police department number three near ger districts was announced. In addition, the issue of patrol officers' protective equipment has been taken care of, and they will be provided to the officers before the Naadam festivities. "However, there is not enough in the budget to resolve every issue. There is a need to increase it," said Ch.Boldbaatar, Chief of the Metropolitan Police Department. Currently, all the protective tools of police officers are being funded by the city mayor's office. The social situation of the police officers leaves much to be desired. Only police officers know how hard it is to stand on the roads during the unbearable heat of summer and biting cold of winter. They say many police officers develop kidney diseases as a result. However, the popular opinion among the general public is that police officers are corrupt. But police officers do not have any supplies other than handcuffs and batons. The uniform that must last for three years gets worn out easily in harsh weather. Officers have to go to a tailor to order new uniforms and pay for it out of pocket. The provided rain coat cannot even protect you from a slight drizzle. They work almost without any breaks, but they do not get salary bonuses or food and transportation allowances. They also do not get paid for working overtime. Even the base salary is not that good. "We will focus on the officers' health and life assurance issues. For example, officers can take advantage of the eight percent mortgage loans as the City Council has approved a 'procedure on supporting mortgage payments of civil servants' said Ch.Boldbaatar. However, not many people can take advantage of this programme due to financial issues. There have been some improvements. Even though there are numerous issues, the police officers are successfully continuing their work using their own resources. Recently, people got to learn what a "good neighbours' relationship" means. The work event organised as a campaign has expanded to be implemented as a programme. Cameras have been installed on most of the major streets nowadays. They are currently working on installing cameras in dark places, which carry the highest probability of attacks on citizens. A good relationship between neighbours that care for each other's safety has become essential as police manpower is limited. Today, police communications and responsibilities have also changed, and people are receiving this change very positively. The Metropolitan Police Department is following a policy to compose their staff from more educated officers, because people mostly criticise the police of three main downfalls: manners in communication, training and experience, and knowledge and education. Training events are being held regularly, and officers are required to earn a certain amount credit hours per year. August 28 (parliament.mn) A delegation of the State Great Hural (Parliament) of Mongolia headed by Chairman Mr. Zandaakhuu ENKHBOLD will be participating the Fourth World Conference of Speakers of Parliament to take place in New York, U.S. commencing from August 31, 2015. This summit of Speakers of Parliament from across the world is a unique forum for dialogue and cooperation between parliaments at the highest level. The overall theme of the Conference will focus on peace, democracy, and development seen through the parliamentary lens. At the three-day World Conference of Speakers of Parliament, reports will be delivered on "Mainstreaming gender equality into the work of parliaments", "Parliamentary involvement in the shaping and implementation of the new Sustainable Development Goals", "Challenges facing parliaments today" and "Parliamentary oversight: Challenges and opportunities" and at a plenary sitting, Speaker Z.Enkhbold to deliver a speech. Moreover, Speaker of the Parliament will be accompanied with parliamentarians Mr. Su.Batbold, Ms. Ts.Oyungerel as well as other officials. Speaker of Russia's lower house of parliament Sergei Naryshkin might head Russia's delegation to the Organization for Security and Co-operation in Europe's (OSCE) Parliamentary Assembly session in Mongolia's Ulaanbaatar, a source in the parliament said Friday. MOSCOW, August 28 (Sputnik) — "Sergei Yevgenyevich [Naryshkin] may head the delegation. The issue of his participation in the session is currently being worked on," the source told RIA Novosti. In early July, Finland denied entry visas to several Russian lawmakers, who were invited to participate in a session of the OSCE PA being held in the country. Naryshkin, blacklisted by the European Union over accusations of involvement in the Ukrainian crisis, was among those refused entry. The Russian delegation did not participate in the Finland session in protest at the decision. The European Union, along with the United States and their allies, imposed a series of restrictive measures on Russia due to Moscow's alleged involvement in in the Ukrainian crisis. Russia firmly denies the allegations. Ulaanbaatar, August 27 (QNA) Qatar Armed Forces have ended the 'Decisive Decision 11' exercise with the Mongolian armed forces in the Mongolian capital Ulaanbaatar. HE the Minister of State for Defence Affairs Major General Hamad bin Ali al-Attiyah, who is currently visiting Mongolia, attended the closing ceremony held on the occasion along with Mongolia's Defence Minister Tserendash Tsolmon, Mongolian Chief of Staff Lt. Gen. Ts. Byambajav, Qatar's non-resident ambassador to Mongolia Sultan bin Salmeen al-Mansouri as well as a number of Mongolian ranking commanders and Qatar Armed Forces officers. The ceremony featured different military parades performed by officer cadets of Ahmed Bin Mohamed Military College (ABMMC) with officers from the Mongolian Armed Forces. Live ammunition was used during the exercise. The ceremony also featured different segments that won the admiration of the audience who praised ABMMC's officer cadets. At the close of the ceremony HE the Minister of State for Defence Affairs Major General Hamad bin Ali al-Attiyah praised the efficiency of the joint forces that participated in the exercise, stressing that the level of the ABMMC's officer cadets has proven the high competence and combat capability they enjoy. He stressed the importance of such participations abroad which raise the level of Qatar Armed Forces and improve their combat preparedness in different circumstances and fields, noting that participation with the Mongolian armed forces comes in the context of the close relations between Qatar and Mongolia. Meanwhile, Mongolian Foreign Minister Lundeg Purevsuren held a meeting yesterday with the Minister of State for Defence Affairs Major General Hamad bin Ali al-Attiyah. HE al-Attiyah also met with the leader of the Mongolian People's Party Miyeegombyn Enkhbold. During the two separate meetings relations between Qatar and Mongolia and means of developing them were discussed. The meetings were attended by Qatar's non-resident ambassador to Mongolia Sultan bin Salmeen al-Mansouri and the delegation accompanying the Minister of State for Defence Affairs. Ulaanbaatar, August 28 (MONTSAME) Mongolian-Russian joint military exercises against terrorism dubbed "Selenge 2015" completed after ten days of intensive training. The maneuvers involved up to 350 servicemen of the Mongolian armed forces and about 500 troops from a unit in the Russian Eastern Military District located in the Republic of Buryatia. The exercises have occupied the Tsugol training range in the East Siberia. The main theme of the military exercises was the anti-terrorism battles in the borderlands with joint troops, and overcoming water blocks with battle tanks. The Russian participants were led by Major-General D.I.Kovalenko and Mongolian troops were commanded by Brigade-General L.Ontsgoibayar. At the closing ceremony of "Selenge 2015", the vice minister of Defense of Mongolia A.Battor, commander of General Purpose Troops of the Mongolian Armed Forces Brigade-General R.Sukhbat and other military leaders of the Russian armed forces were present. The Selenge military exercises are being held each year since 2008. Iran and Mongolia enjoy historical and cultural commonalities, the president said and added "Iran is fully prepared to expand its ties with the country particularly its scientific and cultural relations." August 28 (infomongolia.com) The Ambassador Extraordinary and Plenipotentiary of the Republic of Turkey to Mongolia, Mr. Murat Karagoz has visited Gurvansaikhan sum of Dundgovi aimag with head officials of the Project Coordination Department of the Turkish International Cooperation and Development Agency (TIKA) to get familiarized with the infrastructure conditions of Gurvansaikhan sum and attend the opening of its new sports center on August 26, 2015. Former Minister of Justice, MP Kh.Temuujin; Chairman of Standing Committee on Social Policy, Education, Culture and Science, MP D.Battsogt; Governor of Dundgovi aimag S.Od-Erdene; the State Secretary of the Ministry of Construction and Urban Development, Mr. R.Erdeneburen and Governor of Gurvansaikhan sum, Mr. D.Tumurtogtokh were in attendance at the opening ceremony. In 2014, Ministry of Construction and Urban Development of Mongolia has launched a major infrastructure development program in association with Asian Development Bank (ADB), UN, Japan International Cooperation Agency (JICA) and Korean International Cooperation Agency (KOICA) in Gurvansaikhan sum. Later, Mongolian Prime Minister, Speaker of Parliament, members of the parliament and local authorities have paid a visit to get familiarized with the project implementation and described Gurvansaikhan sum as exemplary sum of Mongolia. The sum's wastewater treatment facility was constructed by a Turkish company also TIKA provided substantial assistance in construction of its new sports center. During the visit, Ambassador Murat Karagoz and TIKA Project Coordinator, Prof. Ekrem Kalan have met with local authorities. At the meeting, Turkish delegation has noted that Turkish government is pleased that could provide assistance in development of Gurvansaikhan sum's infrastructure. In response, the State Secretary of the Ministry of Construction and Urban Development R.Erdeneburen and Governor of Gurvansaikhan sum D.Tumurtogtokh have expressed their gratitude to the government of Turkey for providing assistance in the infrastructure development program of Gurvansaikhan which lasted one and a half year with support of foreign international agencies. Ulaanbaatar, August 28 (MONTSAME) The Mongolia's Ministry of Foreign Affairs Friday reported that Mongolia, through its "International cooperation fund", has donated aid of USD 10 thousand for the Republic of the Union of Myanmar who suffered from floods that occurred at the end of July due to heavy seasonal rains. August 2015 (Association for Diplomatic Studies and Training) Getting a new embassy up and running is a tremendous task, especially when the host city has an annual average temperature of thirty degrees Fahrenheit. Joseph Edward Lake was the second U.S. Ambassador to Mongolia, and the first to reside permanently in the country. He was charged with establishing a functional embassy in Ulaanbaatar and coordinating greater communication between the U.S. and Mongolia. Read more about East Asia and the challenges of opening or closing an embassy in Moments in U.S. Diplomacy. "I sat in this compartment with watermelons rolling around"
I think the challenge, the experience was crystallized for me in a very telling way in August of 1990. On the day before the first democratically elected parliament was held, my deputy, Mike Senko, received a phone call from one of the members of parliament, an opposition member, who said: "Do you have a copy of [the parliamentary guidebook] Robert's Rules of Order?" [At] the last minute, the decision was made for me to arrive a few days earlier. Unfortunately, the decision was made while I was in Hong Kong and before anyone had arranged for tickets or anything else at that stage. It's still very difficult to get tickets on the trains between Beijing and Moscow, which is the one that goes through Ulaanbaatar. "As the Secretary was arriving, the Iraqis were invading Kuwait"
August 27 (IBNS) Ambassador Jonathan Addleton was sworn in on Thursday as the new U.S. Agency for International Development (USAID) mission director to India. Addleton assumes leadership as USAID partners with India to foster in-country sustainability and ownership, with a focus on health, urban water and sanitation, food security, clean energy, early grade reading, and womens empowerment. USAID is also partnering with India in triangular assistance cooperation aimed at addressing development challenges in third countries. These are exciting times to be working in India and I believe USAID could not have found a more capable leader than Ambassador Addleton. His longstanding interest in global affairs provides him with the passion to deliver and achieve USAIDs objectives said U.S. Ambassador to India Richard R. Verma at the swearing in ceremony. A four-time USAID Mission Director (Pakistan, Cambodia, Mongolia and Central Asia), Jonathan Addleton has also served as the United States Ambassador to Mongolia, Senior Civilian Representative for Southern Afghanistan in Kandahar, and USAID Representative to the European Union in Brussels. Earlier in his USAID career, he served as a USAID Program Officer in Jordan, Yemen and South Africa. Prior to joining USAID in March 1984, he worked briefly at the World Bank, Macon Telegraph and Carnegie Endowment for International Peace. His recent recognition includes a Distinguished Honor Award from USAID (2015); the Christian A. Herter Award for intellectual courage and constructive dissent from the American Foreign Service Association (2014); the ISAF Service Medal from NATO and Outstanding Civilian Service Medal from the United States Army (2013); and the Polar Star, Mongolia'ss highest civilian award, from the President of Mongolia (2012). Addletons academic degrees include a PhD and MA from Tufts University (Medford, MA) and a BS from Northwestern University (Evanston, IL). His foreign service languages include Hindi and Urdu. Ambassador Addleton is a career foreign service officer. What's it like being the UK Ambassador in Mongolia? August 28 (Civil Service World) When you first read Mongolia in the title, what came to mind? Perhaps it was a sense of utter remoteness. Maybe it was of horses pounding across the steppe. Or of camel caravans plodding through the Gobi desert. There certainly are horses, camels and wide empty spaces – lots of them. But it's far from the whole story. In 2011 Mongolia topped global growth rates. Not surprising given it's sitting on one of the world's richest mineral reserves, and neighbours China. And at two-hours from Beijing, bustling Ulaanbaatar is easily accessible. In Mongolia the UK has a positive image. We were the first Western country to establish diplomatic relations, in 1963. We have been coalition partners in several recent conflicts. Rich businessmen buy Range Rovers and like to drinkWhittards tea from Wedgewood cups. But when it comes to buying machinery or construction equipment, technology or design Mongolia doesn't immediately think British. Given the possible future size of the Mongolian economy (it has the potential to be the richest country per capita in the world) and the need to increase trade to help reach the government's £1trn export target by 2020, this is a problem. As ambassador, I need to shift perceptions to deliver the UK's objectives in Mongolia. That isn't always easy, but I think three things enable success. The first is the ability to listen. What does Mongolia want to achieve and how? What do those in charge – whether of the country or of a major construction project – want? And what is their perception of the UK in this context? That means lots of meetings and a lot of questions. The second is understanding. This is one of the hardest parts of being a diplomat in a foreign country. But understanding how culture, history and language drives perception is critical to changing it. Our Mongolian staff – 80% of the embassy – are critical to this. The third is using what we've heard and understood to influence. That can range from a GREAT campaign that transforms thousands of people's perception of the UK. Or it could simply be remembering that a senior politician likes a certain Scottish whisky. But this isn't just my job, it's the job of the entire embassy. We're a fairly small outfit of 15 people, so we need to work together seamlessly irrespective of our home department, nationality or job title. Again, many of the barriers are perceptional. I feel passionately that it doesn't matter if your title says "ambassador" or "handyman", every one of us has the ability to listen, understand and influence: we're all ambassadors for the UK. So here in Ulaanbaatar we're trialling regular focus-groups and brainstorms which any member of staff can join. Last week everyone took part in a challenge session before I submit the embassy's mid-year review. Our cleaner contributed ideas for how we can work more efficiently on what we're already implementing. All it took was challenging the perception of what a "cleaner" does. As ambassador I can also help shape perceptions about the British civil service. I love telling senior Mongolians and foreigners that the UK has several job-share ambassadors to ensure we retain talent, and that soon we'll have over 50 female ambassadors worldwide. Because perception is also personal. I can't go to an event without someone rushing up to shake my hand and marvel at the fact that I'm "young and a woman and an ambassador". I'm proud of what this says about the UK. But to be honest, in London, I'd started to feel distinctly un-young. A flirtation with Internet dating didn't help (mid-thirties female – not a great age). I began to convince myself that I'd wasted my 20s wandering round the Middle East rather than climbing the greasy pole, and that postings in Afghanistan and Iraq had taken an unfair toll on my complexion. The shift in others' perceptions about me means I now feel 10 years younger, more dynamic, and even better equipped to face the daily challenges of running a complex operation thousands of miles from home. Perceptions that need shifting to reach our full potential aren't always external. They're often in our own heads. So go on, do something that people might not expect when they look at you. Challenge perceptions. And you might find the response empowers you to achieve even more. August 27 (UB Post) Mongolia is hosting the Asia-Europe Meeting (ASEM) Summit in the last week of July 2016. Over 7,000 participants are expected to attend the 2016 ASEM Summit, according to Head of the President's Office P.Tsagaan, who is leading the working group managing hotel accommodations and conference halls for the ASEM meeting. Mongolia also expects around 1,000 journalists to arrive, following the visits by state heads of 53 countries. The summit is a great chance for Mongolia to get promoted by the guest journalists from all over the world, and observers suggest that it could be a gateway to attracting international tourists and investors to Mongolia. The accommodations for high ranking international delegates is one of the most important issues that organizers face. Several working groups have been appointed to execute preparations to receive the event guests at a high level. According to working group members, large hotels in Ulaanbaatar are to receive the ASEM guests under the same management. The ASEM organizing committee decided to carry out joint management at those large hotels by issuing them loans for maintenance and preparations for the event. Preliminary estimates show that 44 hotels with 3,586 rooms and 5,379 beds will receive the ASEM guests. The ASEM Villa Complex Project is underway in Ikh Tenger to provide suitable accommodations to honored guests from all over the globe. Funding for the project was discussed during the most recent irregular session of the government. The government decided to have Development Bank finance the villa project through a concessional loan, with terms to repay the loan from project revenue. A total of 150 billion MNT (75 million USD) is to be issued to the hotels in loans for ASEM preparations. Each hotel will receive a soft loan of up to 30 billion MNT. The hotels to receive the guests are the city's most well reputed, famous, and most luxurious hotels, such as Shangri-La, Blue Sky, Best Western Premier Tuushin, Ulaanbaatar Hotel, Bayangol, Corporate, Continental, and Puma Imperial. The names of several more hotels, which will start operations next year, are also included in ASEM hospitality plans. With the loans hotels say they will execute all decor and maintenance work, from buying sheets, beds, and dishes to hiring more security. Also, professional chefs and managers will be invited from overseas to conduct training for hotel staff. The loans are to be paid back in three to five years with an annual interest rate of nine percent. ASEM consultant Michael Mattison said at a press conference during a visit to Mongolia, that he believes that Mongolia's hosting of the summit is of great importance, and added that ASEM will give its full support for the successful organization of the summit. It is very common that investment and development are advanced in the host country following the summit. In addition, this opportunity will open doors for Mongolia to sign long and short-term development and financial agreements, and enhance investor confidence in Mongolia. Other countries will likely become more available to Mongolia for cooperation in cultural spheres. August 27 (UB Post) Although Mongolia has lost crops from more than 50,000 hectares to wildfire and droughts, a fresh vegetable farmer's market has opened at Construction Square. The open air market will continue until October 1. The market with the motto "We choose what we planted and produced it in Mongolia" is being organized by the Ministry of Food and Agriculture and Office of the Chingeltei District Governor, in partnership with the organization Global Communist. The market has been organized since 2013 to support the businesses of farmers and small cooperatives. A total of 21 cooperatives from 21 provinces are taking part in the farmer's market, said a marketing specialist from Global Communist. There were also harder to find domestically grown produce such as pumpkin, red garlic, red turnip, red cabbage, organic honey, yellow watermelon, cucumbers, peppers, persimmon and pollen. The vegetables at the farmer's market are being sold at relatively low prices as they are being sold directly from the hands of farmers. SALT LAKE CITY, August 27 (ABC 4 News) IVU Med has a simple motto: "teach one, reach many". A motto that seems to be working. Based in Salt Lake City, IVU Med sends doctors from around the globe to developing countries to perform mainly urologic surgeries. Urology is the branch of medicine dealing with the urinary tract system and the male reproductive system. "Urological birth defects are about 10 times more common than cleft lip and palate and some of the more well-known things that you hear about," says IVU Med executive director Joshua Wood. That means the need for urologic specialists is huge in developing countries. "There's actually a tremendous need for it in these countries and urology for instance and oncology, urologic cancers make up about 25% of the cancer burden across the globe," says Dr. Jeremy Myers, a urologic surgeon with The University of Utah. Dr. Myers has been on three trips to Mongolia, and is about to embark on his fourth. "It's very rewarding to go back to these countries," says Dr. Myers, "It's not just the operations that we do, it's really the training that makes IVU Med really unique." By training doctors, Dr. Myers and his team's impact on the country lasts for years, even decades after he's gone home. By revisiting the same country again and again, Dr. Myers can check up on the progress of both patients and the surgeons he's trained. "On my first trip to Mongolia, we had a young man that was injured, he was crushed by a bus," says Dr. Myers, "His pelvis was crushed, this was at age 16 and he was dependent on a catheter coming out of his abdomen for the next 10 years until we arrived. Then we and the Mongolia surgeons for the short 3 hour surgery, we were able to restore urniary function so he could urinate again. That type of surgery would take about 2-3 month delay in the United States, but this young man had to wait 10 years, and during that time he couldn't have a family, he had a very hard time working due to urinary tract infections and bleeding. On my second trip to Mongolia, the surgeons brought him back to the hospital and I was able to see how well he had done and how grateful he was", Dr. Myers said. Because urologic conditions aren't always visible, they don't get the same amount of publicity that other afflictions and defects get. That means less donations for non-profits like IVU Med. But you can help by liking their Facebook and Twitter pages, or donating to Dr. Myers upcoming trip to Mongolia. August 28 (World Bank Blog: East Asia and Pacific) In the early 1990s, after 70 years of a socialist system, Mongolia transitioned to a market economy and embarked on reform across all sectors, including health. Since that time, the health system has gradually moved from a centralized "Semashko-style" model to a somewhat more decentralized financing and service delivery, with a growing role for private sector providers and private out-of-pocket financing. The main challenge to the system has been to maintain the universal coverage of the socialist period in the face of drastically reduced public funding, while introducing incentives for greater efficiency and improved quality of care. Mongolia's Ministry of Health has identified strategic purchasing as one of the most important levers to more effectively direct limited funds to priority services and populations. Health care provider payment systems—the way providers are paid to deliver the covered package of services—are an important part of strategic purchasing. It helps balance revenues and costs in a way that creates incentives for providers to improve quality and deliver services more efficiently. This ultimately makes it possible to expand coverage within limited funds. In practice though, provider payment systems are often under-utilized as an effective tool to achieve Universal Health Coverage (UHC) goals. In 2014, we produced an assessment of payment systems in Mongolia to help policymakers improve and better leverage these to achieve health sector objectives. Done in partnership with the Ministry of Health, the World Health Organization, and the Joint Learning Network for Universal Health Coverage, it was the first-ever comprehensive and in-depth assessment in the country. The assessment generated important evidence on the strengths and weaknesses of Mongolia's provider payment systems. The assessment showed that the general direction of health care provider payment policy has been effective. Many of the pitfalls observed in other middle-income countries have largely been avoided. The health system objective of achieving UHC is supported by the overall provider budget cap, which has helped control cost escalation in the health sector. We concluded that although more flexibility needs to be introduced into how health provider budgets are formed and used to better match resources with health needs, a major overhaul of the payment systems does not seem to be necessary for Mongolia. As a result of the assessment, a roadmap to improve health care provider payment systems was also agreed upon among key policymakers and providers through a consultative process. The roadmap suggested that in order to further improve and benefit from different incentives of health care provider payment system in Mongolia, three main phases of action are recommended in the next six months to five years. 3. Consideration of geographic equity of payment systems. Do you know how other countries have successfully improved health provider payment systems? Please share them with Mongolia! August 13 (US Embassy) On August 13, Ms. Victoria Augustine, Program Officer for East Asia and Pacific Fulbright Programs in the Bureau of Educational and Cultural Affairs of the U.S. Department of State, held a Fulbright talk at American Corner in Ulaanbaatar, Mongolia. At the talk, Ms. Augustine explained the Fulbright as well as other State Department exchange programs in details and held Q&A session afterward. Ms. Victoria Augustine manages Fulbright programs for many countries in East Asia, and is working in Mongolia until the end of August. To learn more about the Embassy's educational scholarship and exchanges, click here. In response to overwhelming response and interests expressed via Facebook, Embassy is organizing the talk again at American Corner in Ulaanbaatar on August 27, 2015 at 5:30PM. For more details, visit Embassy's facebook page. The American Cultural and Information Centers are small American style libraries. The American Corner in Ulaanbaatar is operated jointly by the U.S. Embassy and the Ulaanbaatar Public Library. To learn more, visit their web page or facebook page. August 28 (news.mn) Experts consider that there is a high rate of the tooth decay among high school pupils. Therefore, the Ministry of the Education, Culture and Science has decided to forbid the sale of sugar products around high schools, taking effect from 1st September. In first phase of the implementation of the ban, carbonated soft drinks are officially forbidden to be sold. Their next plan is to forbid the products, which have high concentrate and amount of sugar and subsequently instant noodles will be banned, in accordance with the Ministry's list. Where does price meet quality in Mongolian education? August 27 (UB Post) While college students protest about their increased tuition fee of three million MNT, private high school tuition fees has reached 50 million MNT. As a lifetime investment, paying 50 million MNT for a high quality education is worth it, but if you consider the living costs in Mongolia, three million MNT is too high. When will Mongolia reach the point where price meets quality? Private education institution costs are higher than ever, as parents are willing to pay anything is asked in the hopes of providing their children with the best education available to possibly win scholarships abroad. The only way they can accomplish this goal is to send them to one of these highly expensive private schools that promise admission to foreign universities. The schools are said to build well-rounded and open-minded individuals in practical and theory-based settings. But have these schools gone too far in price? Last academic year, the most expensive private high-school in America was The Lawrenceville School in New Jersey, with an annual tuition of 46,989 USD. The most expensive high-school in Mongolia is the International School of Ulaanbaatar (ISU), with an annual tuition of 24,229 USD (48,385,313 MNT) for students of grades 11 and 12. For parents whose employers provide academic assistance, the tuition fee is 35,630 USD (71,153,310 MNT) for grades 11 and 12 at ISU. Their classes is 60 percent international and 40 percent Mongolian. Compared to the living cost in New Jersey, Ulaanbaatar is surely much lower. Even if international teachers are getting paid equal to the amount they would receive in their home countries, the other expenditure is likely to cost much less than that of America, for example. Although children from wealthy families study there and have no problem paying the fees, the Ministry of Education Culture and Science should still check and research whether the tuition fee corresponds to the education and environment offered. Additionally, the government helps with the marginal costs all secondary schools depending on the number of students. The government used to give 251,200 MNT per elementary school child, 355,900 MNT per secondary school student, and 373,700 MNT per high school student to schools. Starting from 2015, a new policy emerged and support of private schools decreased depending on their tuition fees. If the school costs above three million MNT, the government support is reduced. For schools costing up to five million MNT, 50 percent of their marginal costs are provided by the state. For ones that cost up to 10 million MNT, 40 percent, and for ones that cost above 10 million MNT, 20 percent of marginal costs are provided. Even when the government is giving money, their tuition fees are higher than ever. The following are price comparisons of Mongolia's most expensive private schools. International School of Ulaanbaatar has the highest tuition fee in Mongolia. For parents whose employers provide education assistance, 11th and 12th graders pay 35,630 USD, approximately 71,153,310 MNT. For grades six to 10, the fee is 33,445 USD or 66,789,665 MNT, and for elementary school students, it's 27,439 USD, or 54,795,683 MNT. For parents whose employers do not provide education assistance, or for most Mongolian parents, International School of Ulaanbaatar charges 24,229 USD or 48,385,313 MNT for grades 11 and 12, 22,743 USD, or 45,417,770 MNT, for grades six to 10. As for elementary school, the school charges 18,658 USD, or 37,260,026 MNT. Overall, this is about a 3,000 USD increase compared to last year. The two-year fee of a graduating class student is equal to the price of a two-bedroom apartment in the city center. A 12th grader at British School of Ulaanbaatar (BSU) pays 19,350 USD, or 38,641,950 MNT, while a first grader pays 10,080 USD, or 20,129,760 MNT. The fees gradually increase by grades at BSU. Third comes American School of Ulaanbaatar in Zaisan, with a tuition of 20 million MNT for high-school students, 17 million MNT for grades six to eight, elementary school children pay 13 million MNT. International students pay two million MNT more in all grades than Mongolians at American School. Note that these fees don't include additional fees, such as registration fees, uniform prices or library and textbook deposit fees. The average household income in America, according to the September 2014 Census Bureau Report, is 51,939 USD. The highest high-school tuition fee is equal to 90 percent of the average household income. On the other hand, an average Mongolian household income is 12,924,000 MNT, or 6,471 USD. The most expensive private high-school costs almost four times the average household income. The average university education in Mongolia costs only a fraction of what these high-schools cost. If 24,000 USD is really what's needed for a quality education, yet Mongolians' average income is only 6,500 USD. At what point does quality meet price in Mongolia's education sector? Ulaanbaatar, August 27 (MONTSAME) Mongolia's Golden Reel Association--a youth-led NGO promoting alternative cinema--has held its annual avant-garde International Underground Film Festival in Ulaanbaatar. It was published on Tuesday on the website of the Swiss Agency for Development and Cooperation (SDC). The festival provided a platform for aspiring young national and international filmmakers to experiment with alternative cinema and showcase their talents to the world. The SDC funded the 2015 festival as part of its cultural and arts grants, contributing to the development of Mongolia's rich and diverse artistic and cultural heritage. The Golden Reel Association has been organizing the avant-garde film festival for the past three years. This year, it expanded its horizons by inviting international filmmakers to take part in the event, attracting more than 200 submissions from 20 countries. Distinguished avant-garde cinema luminaries Peter Tscherkassky from Austria and Eve Heller from the US were on the jury, along with prominent Mongolian directors Byamba Sakhia and Jigjidsuren Gombojav, and Golden Reel Association Director Enkhbat Natsagdorj. Tscherkassky's new short film, The Exquisite Corpse, which was awarded a special prize at Cannes in 2015, inspired young Mongolian filmmakers during master classes on experimental filmmaking. Tscherkassky commended the Mongolian filmmakers' ability and accomplishments, and praised their efforts in creating a unique Mongolian cinematic identity by pushing the boundaries of conventional forms of filmmaking and fostering avant-garde and experimental films in Mongolia. August 27 (UB Post) German Goethe Institute presented necessary instruments worth 25,000 EUR to the only Mongolian jazz class of the Music and Dance College of Mongolia on August 25. The Music and Dance College and Goethe Institute partnered last year to open the first official jazz class for Mongolians interested in learning jazz music. The jazz class enrolls anyone aged between 20 and 30 with proper education and has certain musical talent. The principle of the school, G.Erdenebat, clarified some relevant information. Project leader and German bassist Martin Zenker, who teaches the jazz class at the Music and Dance College, commented about the future goals of the UB Jazz Project. "Mongolian young people learned jazz music diligently, so we [Goethe Institute and Music and Dance College] decided to cooperate again this year. We faced some difficulty in the first year because Mongolia didn't have a jazz class before. This year, we aim to utilize our experience and make the curriculum even better. We will continue this project in the future. Therefore, it's important to train good personnel. I strongly believe that the Music and Dance College will provide assistance and work hard with us," he said. Jazz music was first introduced to Mongolia in early 1940s through circus acts. Experts say that the genre flourished via various forms such as public dance and concerts in the 1960s. August 27 (Deeside Piper) A real-life eagle made a dramatic entrance to a talk on falconry in Ballater last week, after getting spooked and nearly flooring his handler. The sight of 30-odd humans tucking into home-baked refreshments and tea got the better of Boris the steppe eagle's manners. Upon entering the room at Ballater's Victoria and Albert Halls, the raptor took one look around before spreading his wings their full five-foot span and flapping wildly, nearly taking down his handler, Head of International Raptor Research and Conservation, Stewart Miller - but Miller was able to hold on and calm the mighty bird. Then he walked with Boris to the front of the hall, and the airborne terror of small mammals was calm and happy for a public meet-and-greet. Prior to the arrival of Boris, Miller had told the audience about his recent trip to Mongolia, where he lived a week with Ardak the eagle hunter. "One of the things I've always wanted to achieve in my life," said Miller, "is to go to the place where falconry really began. So I went and spent some time with the Berkutchi people, who still hunt with golden eagles." Attendees were then shown a slide show: pictures of the frost-bitten Mongolian landscape, clips of Miller riding with Berkutchi horsemen, each with a golden eagle perched on sticks, and then the eagles taking flight in pursuit of a corsac fox. "It's interesting to note," said Miller, himself an experienced falconer, "that they let two eagles go at the same time. Over here, that could prove to be a bit dodgy." The biggest surprise to the audience was learning that the hunters set their birds on wolves, something the golden eagle would almost never do except through training. It is thought that eagle hunting has its origins in protecting cattle from such beasts. When the golden eagle tackles a fox or a wolf, it grabs the jaw with one talon to stop it biting back, and crushes its skull with the other. This is a skill it learns quickly through keen intelligence. Boris the steppe eagle is a smaller cousin of the golden eagle, from the steppes of Mongolia. He was hand-raised, and helps Miller's conservation work, accompanying him on talks in schools. Ulaanbaatar, August 28 (MONTSAME) The MONTSAME national news agency of Mongolia has published its "Mongolia Today" journal dedicated to the 70th anniversary of the victory on the Liberation War of 1945. Printed in Mongolian, English, Russian, Chinese, Japanese languages as well as in Mongolian script, the journal publishes stories and columns about military and political situations before the war, importance of Mongolian participation in the war and the battle of Janchkhuu. The journal also covers an interview of a retired colonel T.Bat-Ochir, a veteran of the war; and memoirs of Generals I.A.Pliyev and P.Chogdon, commanders of the Soviet-Mongolian cavalry mechanized group. Battles for liberating northeastern territories of China took place on August 19-21, 1945, and it involved thousands of troops of the People's Army of Mongolia. August 28 (infomongolia.com) President Ts.Elbegdorj has issued the first order of 2015 to Mongolian government to commemorate the 70th Anniversary of the Victory in War of Liberation of 1945 throughout the country. Within the anniversary, Mongolian government organizes series of celebration activities to commemorate the heroic deeds of Mongolian soldiers who took part in the war, to honor veterans of the war and pass their patriotic ideology to young generation, promote friendly relations and military cooperation with other countries. As part of the commemorative activities, Mongolian government officials has laid a wreath at the Zaisan Memorial to honor soldiers who to part in the war of liberation on August 28, 2015. Zaisan Memorial was built in 1979 on southern hill, Zaisan, of Ulaanbaatar to honor Soviet and Mongolian soldiers who have died in the Battles of Kalkhyn Gol. UN Human Rights: Happy 'Equality & Pride Days', Mongolia! August 28 (OHCHR) The week of 28 August to 6 September 2015 Mongolia celebrates their third annual Equality & Pride Days, where lesbian, gay, bisexual, transgender and intersex Mongolians and their allies will be standing up for human rights, justice and dignity for all! In this video you can see Free & Equal chief Charles Radcliffe's message to the launch event. August 28 (news.mn) The non-governmental organization of the sexual minority - "LGBT Center" (Lesbians, Gays, Bi-Sexual & Transgender) has announced the opening of the "Equal Right-Pride Days" campaign. The purpose of "Equal Right-Pride Days" is to provide a proper message about the sexual minority orientation to the public. The opening of the campaign is being held today on Chinggis Square. The director of the "LGBT" N.Anaraa said: "we want to exercise our Mongolian civil rights. Our country does not include sexual orientation as a question in population census; therefore, we do not know exactly how many sexual minority people are in the total population". In past times, 12 people suffered as a result of discrimination. This is the third time the campaign has taken place. More people in Mongolia will be able to hear the gospel proclaimed thanks to a ministry partnership. August 28 (One News Now) Far East Broadcasting Company International, Moody Global Ministries and Reach Beyond joined forces to raise more than $300,000 to fund three new radio stations that will repeat the Christian programming that originates from a station in Mongolia's capital city. The increased capacity will allow broadcasters to reach an estimated 75 percent of the former communist country that borders China and Russia. Approximately half of the country's three million people identify as Buddhist while more than a third describe themselves as non-religious. Jon Fugler, vice president for advancement with Reach Beyond, says they are excited for the expansion because of the success of the first station, which saw people come to Christ and churches being born. "And believers will come together, people will come to Christ, churches will be born," he says of the gospel effort. "That's really the ultimate. That's not just evangelism but it turns into discipleship." The ministries hope to have the radio stations up and running by the end of the year. The operational costs for the first year have already been provided. August 28 (Khan Bank) Khan Bank and the Mongolian Golf Association organized the Khan Bank Open 2015 Golf Competition on Sunday 23rd August at the Mount Bogd golf course. A total of 72 international and domestic golfers from the Golf Association of the Republic of Korea, Kevin.B Club and the Mongolian Golf Association participated in the competition. The winning participants were B.Munkhbaatar, who finished in first place overall, Ts.Munkhgerel, who placed second, and B.Altaibaatar, who achieved third place in the competition. In the Handicup category, G.Tamir came in first place, Yu.Tsolmonbaatar second place and B.Batmunkh third place. A demonstration of a hole-in-one by D.Khatanbaatar also entertained the audience. The sport of golf teaches players to respect each other, control their emotions and become persistent. As there are many rules for behavior, respect to counterparts and code of conduct in this sport, it requires a high level of ethics. It is also considered to be a gentlemen's sport that enables players to establish contacts and networks. The Mongolian Golf Association expressed its appreciation to Khan Bank for its valuable contribution to the sport of golf in Mongolia. August 30 (Otago Daily Times) What would persuade a young Paerau farmer to travel 14,000km across mountains and desert in a race with no prizes? Maybe a few too many beers and a conversation during Oktoberfest in Germany a few years back. Lochie Elliot (22), of Paerau, said that was what started the Mongol Rally journey for him and five friends in two 2001 Fiat Puntos, travelling from England to Mongolia and Russia. He returned home last week after completing the race with friends Stephen and Grant Restieaux, of Clinton, Brendon Thomas, of Middlemarch, James Lyall, of Wanaka, and Fraser Leslie, of Clinton. Summing up the trip, Mr Elliot said it was a ''really good'' experience and gave them an insight into what life was like in that part of the world. The Mongol Rally is a charity race across Europe and Central Asia, to Mongolia and Russia with no prize for first place. Vehicles must be under 1000cc, no support vehicles are allowed and teams must raise at least $NZ2300 for charity. His team, ''Sheepish Kiwis'', raised about £1670 ($NZ4000) for Cool Earth, a United Kingdom-based charity chosen by race organisers, which works to save the world's remaining rainforests. The team took 32 days to travel the 14,000km across Europe, Turkey, Georgia, Kazakhstan, Mongolia and Russia in two vehicles. The roads throughout the race were ''tough going'', especially in Kazakhstan, where the team avoided driving on the main roads, and instead drove through paddocks. The poverty along the way in the former Soviet countries as well as ''supposedly Western'' countries, like Hungary and Romania, was an ''eye-opener'', Mr Elliot said. Highlights included a trip to Gallipoli in Turkey, and seeing the Blue Mosque in Istanbul. Travelling with friends in cramped conditions was challenging at times too, and the hot weather, with temperatures some days reaching 52degC. Along the way there was only one small ''break down'' incident, a flat tyre, but otherwise they got through without a hitch, he said. However, the vehicles, named Poppy and Fanny, were ''pretty buggered'' by the end of the race, with broken shock absorbers, snapped rear springs, and a ''pretty rusted out'' floor. Mr Elliot was now working on his family's farm in the Paerau Valley, while team mates were back home in Otago and Australia, while one started his overseas experience in England. Mr Elliot said he would highly recommend the race to anyone who wanted to do something outside the ''normal'' on their OE. Bishkek, August 28 (24.kg) The archer from Kyrgyzstan, Edil Sadygaliev, has won an international tournament in Mongolia. This is reported in the press service of the State Agency of Physical Culture and Sports of the Kyrgyz Republic. According to the data, the day before passed the Shuvuulahuy Naadam international and national games were held in the city of Ulan Bator. The representative of Kyrgyzstan took the first place at the traditional bow shooting at a distance of 40 meters. It is reported that athletes from Mongolia, Kazakhstan, Uzbekistan, China, Qatar, Pakistan, and the Kyrgyz Republic participated in the competition. The goal - development of the nomadic ancient games. August 28 (gogo.mn) The Ganga Lake Festival is a new event initiated in 2014 for the preservation of the delicate Ganga Lake ecosystem and the local Dariganga minority culture in Sukhbaatar province (eastern Mongolia). The festival is to take place on 05-06 September this year. Despite being a small lake of only 4 sq.m in size, the Ganga Lake is famous among the Mongolians and international bird watchers for being a home to the annual Swan gathering in autumn, swans and other migrating birds group in the Ganga Lake and prepare for their long journey for spending winter in warm destinations. The Ganga is a freshwater lake and situated in the steppe long with a few other smaller lakes near the Dari Mountain and Moltsog sand dunes. The area was taken in the state protection as the unique ecosystem of the Dariganga area in the late 1990s, however, in the late years the bionetwork has been damaged greatly due to the global climate change and fault of man such as mining. The Dariganga ethnic minority inhabits the Dariganga region and is noted for being the best silversmiths among the Mongols and also fine horsemen. The Dariganga style of silversmith is uniquely sophisticated design and the Dariganga silversmiths have refined and passed the technology from father to son for centuries. Moreover, the area is also well-known for a traditional ground-oven, which is only built and used by the Dariganga women. The Ganga Lake festival will last for 2 days on 05-06 September and will showcase the best of the Dariganga culture and raise awareness on the vanishing ecosystem of the Ganga Lake. During the festival, there will be music performances of the locals, felt making ceremony, market of local dairy products, embroidery and silversmith workshop and trade, meeting of the Dariganga researchers, horse races, folk song contest, and also the local horsemen will show off their famous horse culture for visitors. For more info about the event, tickets and package tours, please contact New Juulchin Tours 7010-9401 or 9900-3506. Photos are provided by Juulchin World Tours.